Excellent value. This vacuum picks up the dirt, is quiet and seems to have a great filter in it. For under $200, I don't think it can be beat. We picked up the Shark vacuum from Bed Bath & Beyond. It was available everywhere, but the 20% off a single item coupon sent us their way. As of January, 2012 it is $199 just about everywhere. From reading reviews online we found enough happy, former Dyson owners to convince us to take a chance and bite on this Shark. It takes just a minute or two to put together the vacuum once you get it out of the box. A half sheet quick start guide is enough to get you going. Since the canister lifts off the power brush to convert between an upright and a canister vac, the parts go together easily and without tools. The Shark rules the stairs. They haven't had much love lately because our old vacuum was a pain to lug up and down the stairs. With the Shark you can press a button and lift the canister off the wheeled-base and carry it up the stairs. Shark has several Lift-away models that would work equally well. The Pro model comes with a pet brush. It attaches to the hose, has about a 4" brush that rotates inside a housing. 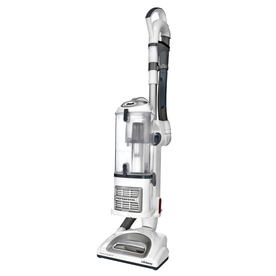 It is powered by the suction of the vacuum and a small belt drives the brush. It works wonders on the stairs. On the Shark site you can order replacement parts. Right now they list filters, dust pads, on-board tools, a handle with the hose, the complete dust cup assembly, motorized floor nozzle (the powered brush part, the base that makes it upright) and a fitler door. It looks like the only major part they don't show is the vacuum itself. They claim the belt won't wear out because it will disengage when something is stuck in the brush, but I don't see replacement belts on the site. There are two motors in the Pro Lift-Away, one in the canister to provide suction and another in the lower brush assembly to spin the brush. When you set the canister onto the base and snap it in, two prongs connect to provide power to the brush. The head of this vacuum is pretty narrow, the brush is about 10" wide. If you have a huge room it will take you a while, but if you have a lot of tight places to get into and smaller spaces it is perfect. On first use the dirt in the cup was very fine. I don't think our old vacuum picked up nearly as much as the Shark did. For hardwood floors, tile or area rugs that may be eaten, you can turn the suction on and leave the brush off. This package came with a hardwood attachment that we haven't tried out yet. Think of it as a Swiffer with a vacuum hose attached. It looks like it could work. The "navigator" feature (handle that tips left and right) is odd, but nice when you get used to it.